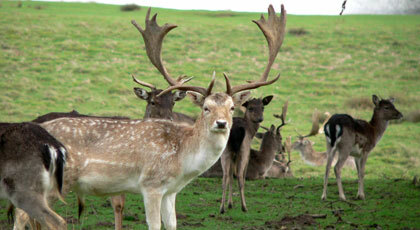 The fallow deer acclimatized easily in a few favorable areas from the west, south, south-east and north-east of the country. The naturalized populations are viable from the quality and numbers point of view. Valuable trophies were obtained in various areas, the first ten being over 190 CIC points, while the series peak is 204,06 CIC points. Hunting season: trophy bulls October 10th - December 1st, selection bulls 1st of September - 15th of December, does and fawns: 1st of September - 15th of February.